I love mini albums! They are a fabulous way to create a special keepsake without taking too much time. And this little book design is so darling I just had to share it with you! It's very easy to make and adaptable to any album theme. To create this mini album, I used three sheets of Chatterbox Sun Room Cardstock (Chatterbox Sun Olive Sunbursts Cardstock, Sun Summer Plaid Cardstock and Sun Summer Stripe Cardstock, green cardstock, green ink and orange ribbon. Cut both the Sun Summer Plaid Cardstock and the Sun Summer Stripe Cardstock into quarters so that you end up with 8 6x6 pieces. These will be the pages of your book. Ink the edges of each piece on both sides with green ink and set aside to dry. Cut two 6x6 pieces from Chatterbox Sun Olive Sunbursts Cardstock. These will be the front and back covers of your book. Cut two 6x6 pieces of green cardstock. Adhere one to the back of one of your 6x6 pieces of Sunbursts Cardstock and the other to the back of the remaining piece of Sunbursts Cardstock. This gives your cover extra strength. Ink the edges on both sides with green ink. Stack your pages in the order you wish them to appear in your book. Take the front cover of your book. Punch a hole approximately 3.8cm from the bottom edge of the book and 0.8cm from the left edge. Make sure your hole is large enough to fit a piece of ribbon through it several times. Punch another hole inline with the first, only this time make it 3.8cm from the top edge of your book. Use the front cover as a template to punch holes on the left side of every page. These holes are the means by which your book will be held together so they must be inline with each other. Once again, take your front cover. Gently fold a line from top to bottom approximately 1.3cm from the left edge. Repeat for every page except the back cover. 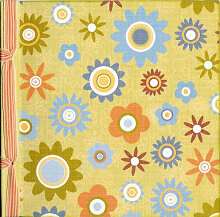 Cut a piece of Chatterbox Sun Olive Sunbursts Cardstock measuring 3cm by 15.2cm (6 inches). Turn it upside down so you are looking at the green underside. Wrap it around the left side of your album to create a spine. Adhere it in place. Approximately 1.3cm should overlap the front cover and 1.3cm should overlap the back cover. This leaves about 0.4cm covering the width of the book. Please note: The inside of the book is not yet secure so be careful you get the right width. Open your book and remove the pages. Use the covers as a template to punch corresponding holes in the spine you just attached. Then put you book back together. 1. Thread the ribbon up through the bottom hole, leaving some ribbon hanging from the back of the book. 2. Wrap the ribbon around the bottom edge of the book and thread back up through the bottom hole. 3. Wrap the ribbon around the left edge of the book and thread back up through the bottom hole. 4. Thread the ribbon down through the top hole of the book. 5. Wrap the ribbon around the top edge of the book and thread back down through the top hole. 6. Wrap the ribbon around the left edge of the book and thread back down through the top hole. 7. Tie the two ends of the ribbon together at the back. Finally, decorate your book as you wish.